A text on class conflict in Oxford and the Blackbird Leys riots of the early 90s. At its very outset Oxford University was established to tie together the hegemony that would run dear old Albion for ever more. In Oxford science, religion and the aristocracy pooled their resources to deepen, mystify and finance their power. The presence of the working people of Oxford was permitted essentially only in order to facilitate all this cerebral masturbation. First published probably in autumn 1991. Some weeks ago the world was surprised to discover that Oxford had a working class, council estates, no-go areas and joy riders. The City of Dreaming Spires that had supplied the world’s establishment with tyrants, fascists, Marxist/Leninists and an intellectualised bourgeoisie has been a facade for a class war that has been waged for hundreds of years in and around Oxford. Bit over the top? Exaggeration ? Let FiFi La Rue (an Oxford Resident for many years) guide you through the darker side of Oxford’s past and present. At its very outset Oxford University was established to tie together the hegemony that would run dear old Albion for ever more. In Oxford science, religion and the aristocracy pooled their resources to deepen, mystify and finance their power; let us not forget their resources were the products of forced economic systems of serfdom, land ownership and physical coercion. Slowly as the centuries ground on Oxford (and to a lesser extent Cambridge) became an exclusive playground for the establishment to arrange the social order under capitalism not only in Britain but right across the Planet. Meanwhile, their presence permitted only in order to facilitate all this cerebral masturbation, the working people of Oxford began to evolve. Scouts (cleaners), servants, maids, apprentices, shopworkers, carpenters, cobblers, tailors were massed together in squalid corners of the town. Areas such as St.Clement’s, Jericho, Osney, became synonymous with Oxford’s poor. During the 17th, 18th & 19th centuries, just spitting distance from the Colleges, Oxford’s poor suffered from plagues of cholera, poxes, leprosy and typhus while their women were driven to prostitution to serve the sexual appetites of the Gents in the Colleges. 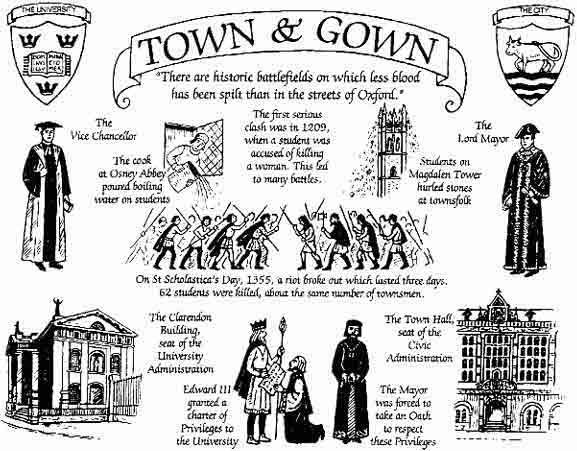 Whenever the poor of Oxford got together in a recreational mode and got pissed the resulting riots were legendary, the market in St Giles being a favorite starting point. Students were often beaten and sometimes murdered by the ‘Townies’. By the mid-19th century the relations between the working class and colleges of Oxford became commonly known as Town and Gown; on May the 1st every year at 6 o’clock in the morning ‘Townies’ would descend on the Colleges to chuck what students they could find in the river, after the obligatory slapping of course. The problems and pressures this conflict created in the City, added to the possibility of the squalor and disease permeating the sacrosanct colleges who were looking to expand, led to the City authorities moving the problem out of the City....no, not the colleges to move, the poor. The 20th century saw Oxford’s poor relocated outside of the City. Estates were constructed on the outskirts of the town, the houses closest to the town were all occupied by bursars, dons and students.The new council estates were put beyond these residences, a mile or two walk from the town. In one famous instance a council estate was built in N.Oxford and in order to prevent the working class from using their road to come and go to the town, the middle classes in their huge detached houses built a 6 foot brick wall across the road, preventing access to the people from the council estate; the famous Cutteslowe Wall stood for seven years before it was knocked down by a tank driven by soldiers recruited from Oxford’s Townies. Other estates were built during the 1930’s & 40’s at sights at Rose Hill, Donnington Bridge etc., all of them on the periphery of Oxford’s middle class. The dons, bursars could go backwards and forwards to their work at the colleges without being reminded that workers also lived in Oxford. The Cowley car works offered employment to people from all over the South of England, Wales and the Commonwealth, after the 2nd World War they came in their tens of thousands. To house this influx of workers old estates were expanded. Other Estates were constructed in the late 50’s & 60’s even further away from the colleges. Barton, Berinsfield (called Dodge City because of its Wild West reputation; all of the ‘problem’ families were moved out of the Oxford area to this estate, which is about 6 or 7 miles out of the town), and the now famous Blackbird Leys. Blackbird Leys sits on top of the car factory, almost everyone on the estate over the age of 25 has worked in this stinking, back-breaking, demoralising hole. Its filth is pumped out of chimneys to settle on the estate, blobs of paint from the paintshop spotted cars and washing alike. One good thing came out of the factory for the residents of Blackbird Leys: that was a strong political sense of solidarity and autonomy on the estate. Racial conflict was/is almost unheard of, racists that attempted to divide the community were often identified when unity in strike action and pickets were called for. As scabs were often racists too, they were easily identified and easily dealt with, both inside and outside the factory. Solidarity on the estate grew from the proletarianization that was developed in the factory, added to this was the fact that 2 or sometimes 3 generations of the same family worked in the factory and lived on Blackbird Leys. This is a tight community... reciprocal strands of loyalty and support permeate the whole estate. Everyone knows someone who knows someone and so on. They went to school together and now their children go to school together...even the nurturing of the young of Blackbird Leys was socially confined to the schools on the estate. The kids on the estate grew up with the car factory up the road as a symbol of their future, many would end up working in ‘the factory’ assembling cars. By pooling experience and information groups would specialize in getting you a radio or a new battery, spray paint and so on out of the factory. Some workers were even trained by the company to break into cars without damaging them...all of this information was pooled. The company slowed its recruitment down to nothing about 6 or 7 years ago and the kids would break into the new car compounds at night and joy ride the cars around these huge fields, often chased by Security Guards. In one incident two workers INSIDE THE FACTORY (not kids from the estate) were seriously injured in their lunch hour joy-riding MG Montegos around the car parks. Radios, cassettes and tyres, and sometimes whole panels, were robbed by kids from the estate from these compounds. The company stopped that by putting infra red night cameras up with a direct link to the local nick. The car then became a symbol of the local source of income and if it offered no income, it was used as a tool of ridicule. In the last 3 or 4 years posses have emerged all around Oxford; they’re multi-racial, sussed and sharp, stealing high powered cars is the symbol of their nexus, they come together on any night of the week to do hand brake turns at about 100mph and so on in front of crowds just coming out of the pubs at ll pm...why buy a video and go home when you can eat your chinese or fish and chips, sitting on a wall with your mates watching someone pretending to be Steve McQueen or Eddie Murphy...joints are passed around and cans of beer are opened, the empties are lobbed at passing police cars, a kind of community recycling...cans to weapons...the police eventually became powerless to intervene about 18 months ago because the monitoring technology used by the posses was so highly sophiticated they knew well in advance what the police were up to...occassionally moving venues to another estate if they suspected a police crackdown. The scanners they used to monitor the police were stolen from shops in Oxford as were their ReeBoks and French Connection clothes... They find themselves excluded from the University and its facilities for young people, unwanted by local employers, untrained and pitifully short of cash; the Community facilities were built for workers with cash not for penniless young people with nothing to do. So, prevented from working on cars they took to stealing them instead; many were stolen and then stashed in garages for weeks, brought out to be driven madly all over Oxford. Blackbird Leys is not the only estate or area affected by joy riders in Oxford, but for some reason the police have concentrated their attention to this close and closed community...often to the point of absurdity. Two years ago the police launched a series of dawn raids all over the estates of Oxford the purpose of which was to ‘Smash a car stealing ring’; the police declared to the local press that they had smashed a major car theft gang “Centred In Blackbird Leys”...the outcome was only two prosecutions - one for a bent MOT and false number plates, the others for a false Log Book..hardly major..hardly anything really. The same thing happened 4 years ago on a ‘major drug bust’ on a pub on the estate...only grams of hash were discovered and only 3 people arrested...no kilos of heroin or crack..hardly a big drug problem. The police have had a real problem in policing such a tight community; with only two pubs on an estate where everyone knows everyone else the old bill, and strangers, stick out like sore thumbs. The social solidarity in Blackbird Leys meant the only method the police had of dealing with crime was not the ‘softly softly’ approach but more the heavy hand of the dawn raid and riot squad hoping they would catch something worthwhile. It is hardly surprising that a car culture exists in an estate like Blackbird Leys, but what disturbed the country were the scenes of riots coming from this ‘well-off’ estate. Again the keys to understanding this lie in the role of the university and its profile...students that are arrested and then not charged by the police are having a bit of fun, the kids of Blackbird Leys revelling around the town on a Saturday night are banged up for affray or ABH; the local paper is full of headlines like “Estate thugs jailed” while on the next page you read “Students fined after night of violence” - the working people of Oxford have lived with this glaring inequality of social control for hundreds of years. Drugs are available all over the campuses of Oxford but the police are powerless to enter these premises... so they raid Blackbird Leys instead...When the daughter of a prominent aristocrat was found OD’D in her ‘hall of residence’ the police raided working class pubs and clubs all over the town..when some Hoorays smashed up a restaurant in Woodstock some years ago and badly beat up the manager they got a fine and a telling off AT CROWN COURT. The same week some lads from Blackbird Leys and Barton were jailed for two years for having a punch up with some Chelsea fans where no-one else was injured and no damage to property or person was reported...high profile though. True to form the police have reacted to the joy riding only when the Nation’s eyes were on Oxford...no-one was hurt until the police stepped in...the police were complaining in the local nick about no overtime and undermanning right up to the explosion in the media then they got all the men and overtime they wanted....to ‘save’ Oxford from the joy riders they resorted to violence themselves...isn’t the State wonderful...its only real sanction is its most potent...violence. OK so what does this mean to Anarchists and how should we take it...firstly it’s necessary to address the whole history of the working class in Oxford not just the bits we’ve seen in the Media. Situationalism this isn’t. This class war goes back centuries...why was it missed before? The university would hardly blame itself for the privations of the Council Estates of Oxford, but ask yourself why the universities, having moved the working class out of the city, are now doing up their old 2 up 2 down terraces and filling them with lecturers, dons and bursars ? Boot the working class out and move the yuppies in. As a result Oxford has no Inner-city problem, all of the problem areas are on the periphery and don’t qualify for special attention re: inner city grants and extra funding. There is a pervading myth of affluence around Oxford...don’t believe centuries of University and hegemonlc propoganda...question the past before you attempt to analyse the present. Secondly the inequalities of social control that are operating in towns like Oxford, sanctioned by elitist bodies like the University, cause communities like Blackbird Leys to react: this kind of street violence is the symptom of earlier and deeper social conflict. The social solidarity displayed by the people of the estates was fractured when the car factory stopped recruiting and the joy riding began...thus the community of Blackbird Leys split over the issue of joy riding gave the police and the bourgeoisie the opportunity they wanted to slag off the working class of Oxford. Establishment versus Community (no matter how yobbish you view the joy riding in Blackbird Leys you cannot deny that the authorities have driven a wedge through the community...those FOR the joy riding and those FOR the police action against it..split the solidarity of the community and the police can then take sides...thereby justifying more intervention and police action on the estate.). Thirdly we must start to identify and understand those continually emerging symbols that unite people against the State...and those that provoke the state to reveal its true intentions... In Oxford it was the car, in Newcastle it was ram raiding (the car), in Cardiff it was an unpopular shop keeper (shoplifting and petty theft), to the New Age Travellers it was Stonehenge, in Tottenham and Brixton it was racist police (state) violence against the innocent individual that caused conflict, in Manchester it is drugs...and all around Albion it's Raves. As a result of Tottenham and Brixton, racism in the police and its institutions was identified, the result of which is that the whole credibility of the police has been shattered; the Guildford 4 and the Birmingham 6 have identified how racism plays its part in the judicial process...If you’re Irish you’re a bomber, if you’re black you’re a pimp/dealer/ guilty and so on...slowly but surely the state reveals its hand of symbols and is finally trumped but always too late in the game, the damage is done and the state and its agents brings into play the resources to cover its bloody tracks. We need to identify these symbols earlier and wave them in the faces of the etatists before they pick them out of our pockets and start belting us with them. We must begin to set the agenda for conflict, not stick to theirs. That’s why Blackbird Leys got right up their nose, the community set the agenda. Alternatives to those accepted forms of social protest such as marches, community centres and local action groups are popping up all over the country & the symbols that these alternatives throw up are enormously important for us to understand how the state will react against people who organise themselves for themselves...identify and mobilise those symbols, don’t rubbish them like the media and leftists....On what symbol will the state’s attention fall next ? Watch your backs...with Leninism disappearing up Its own arse...Anarchists could be next. Be ready!. endangeredphoenix 1: In the aftermath of Poll Tax, anarchists tended to think they were a special case. This is the only really bad sentence in this text.